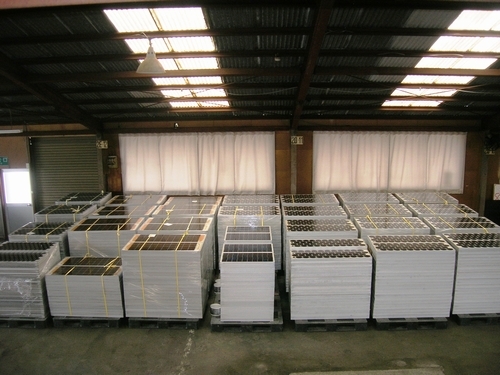 Copyright Next Energy and Resources Co.
Next Energy and Resources Co., a Japanese company that supports the use of natural energy and operates the Photovoltaic Units Recycling Center, procured a large volume of used solar panels that had been used since the 1980s, and started the sale of them on April 7, 2009. Next Energy and Resources procured 1,700 panels, each of which was rated to deliver 20 to 40 watts, amounting to a total output of about 100 kilowatts. These panels had been installed for about 20 years from December 1989 to February 2009 in Shirahama Energy Land, an amusement park located in Shirahama, Wakayama Prefecture, in western Japan. Before that,, the panels had been used as equipment for research and development/demonstration experiments in Hamamatsu City, Shizuoka Prefecture, in eastern Japan, making them 25 year-old panels. The company finished testing the performance of around 330 panels and demonstrated that at least 90 percent of the panels can generate 80 percent or more of their rated output. These panels would have been discarded as waste metal, as is usually the case for solar panels that become unnecessary, if the company had not reused them. In January 2008, Next Energy and Resources had a similar experience; in Kamishihoro-cho, Hokkaido, in northern Japan, the company found 6,500 solar panels which were roughly 20 years-old with a total power generation of about 300 kilowatts, equivalent to the amount of energy used by 100 houses, and reused them. On the back of this, the company continued to look for solar panels since it assumed that there would be more similar cases in Japan. The company will continue to conduct such investigation in order to unearth potentially valuable resources.